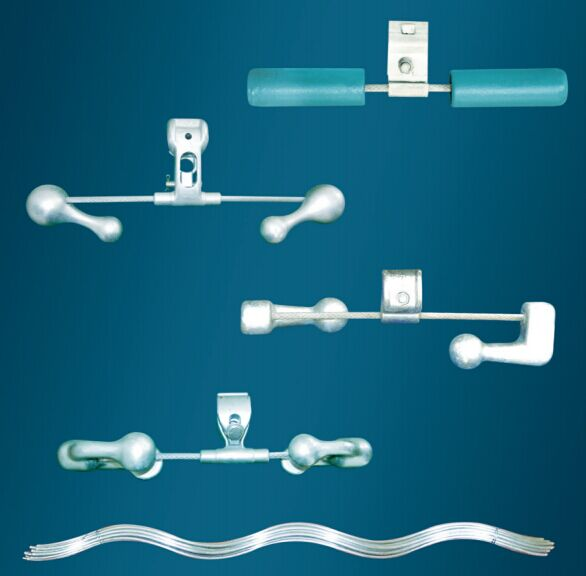 Product categories of Protective Fitting, we are specialized manufacturers from China, Protective Fitting For Distribution Line, Protective Fitting For Substation suppliers/factory, wholesale high-quality products of Protective Fitting For Power Plant R & D and manufacturing, we have the perfect after-sales service and technical support. Look forward to your cooperation! The Protective Fitting is primarily used to protect conductors, insulators and so on, including the grading frng for protecting insulators, the counter weight to prevent insulators up and the damper,armor rod that can avoid the vibration of conductors. The protective fitting can suffer the aeolian vibration but make no fatigue damage. It bears some mechanical load. Protective fittings generally include dampers, spacer-dampers (for double, three, four, six, eight-bundle conductors),preformed armor rods, aluminums tapes, counter weights, grading&shielding rings, arcing horns and so on. Generally, greyiron, malleable cast iron, steel, and aluminum alloy are used as it's materials. All the ferrous metal should be hot-dip galvanized.